£10.00 + £2.00 postage and packing. CDs are in stock and will be dispatched straight away. 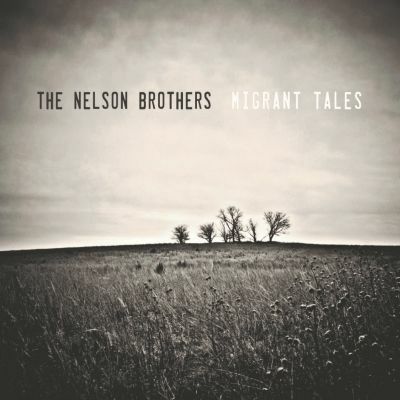 Migrant Tales – the 4th studio album by The Nelson Brothers. Migrant Tales is not quite a concept album – but it has a loose theme running throughout. The songs are about the Irish Diaspora – the Irish people and their descendants who live outside of Ireland. The Nelson Brothers own ancestry is notable here. Historian John Herson, from Liverpool John Moores University, has written a paper that he is delivering at University College Dublin “Divergent Paths: A Family History Approach to Irish Migration and Settlement”. He has used Simon and Steve’s Corcoran family ancestry as a case study. The Nelson Brother’s great, great grandparents, Patrick and Catherine Corcoran came from Tibohine parish, six miles north of Castlerea in Co. Roscommon. They survived the immediate impact of the Famine but moved to Stafford, England in the 1850s. There’s a song on the album called Billy Corcoran, which is a fictitious account of a relative emigrating to the US. "The Nelson Brothers take you on a musical trip from Ireland to America. Definitely the scenic route. 8/10"
Sometimes it can be good to take your time. ‘Migrant Tales’, the fourth album from The Nelson Brothers, has been written over the course of twenty years. Loosely based on the Irish Diaspora, the songs deal with family, history, migration and travel. There are stories here that link to the past of several countries. Steve and Simon Nelson, the heart of this accomplished band, hail from Stafford in the UK but have Irish heritage and links to the United States. Their travels and their relationship with the past have clearly influenced their music in an eclectic and positive way. As an interesting aside, when Oscar-nominated actress Elizabeth McGovern (Downton Abbey, Once Upon a Time in America) wanted a backing band to perform and record her self-penned material she enlisted the help of The Nelson Brothers, who found critical and commercial success touring the world and recording as part of her band Sadie and the Hotheads. More history and travel to add to the mix. The music is mellow and rich Americana. Folk and country influences are just part of the palette though. ‘Migrant Tales’ is part of a wider songwriting tradition. Steve Nelson’s gravelly voice evokes Tom Waits in sound and song and his brother Simon expertly adds family depth to the singing. Expert playing throughout compliment the songs perfectly. Songs such as ‘Jesus on the Road’ evoke classic American road imagery. You can almost see the highways, prairies, cars and people. ‘Dark in the Heart’ is a piano driven ballad that feels like an old movie. This is a collection of high quality, traditional sounding songs. It’s a relaxed listen that will take you on a journey through America and beyond. Well worth the trip. ”You’d never guess that the Nelson Brothers – Simon and Steve – grew up in Staffordshire as they sing of prairie skies, drifters, and tumbleweeds over a backdrop of banjo, dobro, mandolin, fiddle and weeping pedal steel. That the latter is played by Flying Burritos/Manassas legend Al Perkins adds cred to their aspirations, but their Americana love affair is clearly so genuine that there’s no reason to question their “authenticity”, whatever that loaded word means in this context. The whole Irish Diaspora has long fascinated artists and historians alike. Now adding to the creative library on this subject are U.K. – based duo The Nelson Brothers with their fourth album. It’s cover pictures are taken by a Nebraskan photographer who captures the bare beauty and stark terror of outback landscapes. No doubt countless migrants have felt the same awe and fear on arriving in new pastures. The Nelsons keep things fairly homespun on a mostly acoustic set. The country pop picking of Ramblin’ Man makes for a sturdy opener with it’s portrait of a rootless character. Then a restless Gospel feel to Billy Corcoran also helps set the template. The latter is based on an Irish relative of the brothers who survived the Famine, before moving to England and becoming a borough councillor. Some sweet Irish trad twirlings lift My Prairie Rose into a standout piece; Hobo Child offers the melodic rush of David Rawlings; Dark in the Heart has piano and pedal steel amid Waits-like barfly phrasing, and then Jesus on the Road cuts into real cosmic country. An album peopled with drifters and cowboys, Migrant Tales brings a quiet sense of dignity to the timeless expatriate narrative. The Nelson Brothers hail from Stafford, which comes as a surprise given the heritage of the guest musicians and not least Stephen Nelson’s voice – he really is a dead ringer for Johnny Cash! This is their fourth album, earlier material dating from as far back as 1994 but this last one took just seven days to record. It feels like a very personal album for the Brothers, exploring their ancestry, childhood longing for adventure and travel, journeys into the heart of Americana, their relationship with those who went before, their love of literature and their immersion in the roots of American music. The album features a host of talent, and the musicianship is second to none – including the legendary Al Perkins on pedal steel guitar. The result is a rich mix of emotional songwriting, understated arrangements, soundtracking vivid and descriptive tales, with some full-on bluegrass to boot. Although the songs explore many themes, my one ‘health warning’ if you like is that there is an unremitting sense of loss, loneliness and general angst running through the album – it’s not going to lift your mood or fire you up to face the day! The quality of musicianship and songwriting is high, but the brothers might like to introduce more light and shade to future selections. That aside, this is a band of high quality musicians, if you like Americana you will love this. Lest anyone be confused, first up let’s just clarify that The Nelson Brothers are not the American twin sons of a well-known rock and roll star, rather, we are talking siblings, Simon and Steve Nelson, originally hailing from Stafford, but whose musical history is, to say the least, eclectic. Initially influenced at home by their father’s collection of mainly American country music, in their late teens, they were introduced to the folk music of the US, Canada and UK. Following time in the mid-1970s spent busking in Amsterdam and Cornwall, a twelve-month residency in Bermuda saw their exposure to the less commercial side of traditional Irish music by way of the likes of Christy Moore, Planxty and Paul Brady. They undertook various solo projects in the 1980s, during which time both continued writing. This eventually resulted in a record deal and the release of their first album Hometown in 1993 and saw them perform with a range of roots and international country artists. Indeed interest in them was sparked by prominent American songwriter/publicist Robert John Jones, and time was spent writing in Tucson and demoing material in Nashville. Two more albums followed. All of the above and more have clearly had an influence on the musical styles present on Migrant Songs, their fourth studio release. Whilst not a concept album in the accepted sense, there is, nevertheless, a common seam running throughout, that of the Irish people and their descendants living outside of Ireland, with the songs relating to their exodus from the home country. Given their family history, the brothers’ great, great grandparents, having survived the Famine, moved to Stafford in the 1850s, the pair seems well-placed to address this subject through their own music. The songs on this very personal album delve into this ancestry, examining their connections with those who preceded them, their boyhood hunger for adventure and their sojourns into the American heartland. Musically, the palette is one that might be described as ‘eclectic roots music’, the sound-paints used being informed by the palette is one that might be described as ‘eclectic roots music’, the sound-paints used being informed by elements such as country, folk, blues, jazz and Americana, all of which are held together by Steve’s full-bodied vocals and some very fine guitar playing by Simon. Being brought up to believe that honesty is the best policy, time for a confession. When I initially loaded this CD and began listening to the first track, I did wonder whether I had received a mis-pressing, and that what I actually had was an un-released Johnny Cash circa American III or IV gem, such was its similarity to the output on those albums, (compliment intended). The Ramblin’ Man presented here is neither the version written in 1973 by The Allman Brothers, nor that of Hank Williams, written in 1951, but their own, self-penned salute to those restless, rambling heirs, both past and present, of Kerouac’s On The Road dream, and it is certainly a cracking opener. On the second track, whilst their maternal grandfather’s name was indeed Corcoran and several of his relatives emigrated to the USA, Billy Corcoran is a fictitious account of one of them emigrating to the US, the gentle lilt of the song showcasing Steve’s rich vocal delivery to great effect. Clear Blue Prairie Sky is, again, partly inspired by literature, Bad Land: An American Romance, Jonathan Raban‘s research into settlement in Montana in the early 20th century in which innumerable settlers, many of them immigrants, went west to make their fortune and build a civilization on the prairie, only to see it collapse within little more than a decade. The song is their take on the allure and fear of the harsh territory that was the backdrop to the ruination of these pioneers. A song about mountain life, Long Way Down, whose inspiration came from the murder ballad Tom Dooley, chugs along with guitar and keyboards to the fore, one can imagine that live, the final guitar solo, which here fades out all too quickly, will be allowed full rein. The expressive Dark In The Heart, in which the open spaces of sky and desert, long stretches of highway and lonesome prairies are explored in a somewhat melancholic way, ‘It’s dark in the heart of the lonely’, features some fine pedal steel guitar from guest Al Perkins, (Flying Burrito Brothers, Souther-Hillman-Furay Band, plus so much more) with vocals at times sounding very reminiscent of Tom Waits. With the thoughtful Hobo Child, a paean for migrants everywhere, drawing on Lost Highway written and recorded by blind country singer-songwriter Leon Payne in 1948, and made famous by Hank Williams, and Jesus On The Road, a song imagining a journey to the Southwest of the US, following in the footsteps of the Gram Parsons, whilst wandering the streets of a cold winter’s day in London, these two vignettes embody the compositional strength inherent in their writing. The Nelson Brothers are undeniably very fine songwriters and musicians. The songs on this album are a wonderful synergy of thoughtful lyrics, accomplished music and resonant vocals, and reflect the many influences that they have been fortunate to experience over the years. Migrant Tales leads the listener on a thoroughly enjoyable and evocative musical trip, it would be foolish not to get on board and share in their journey.